Stunning position overlooking the Gardon river. 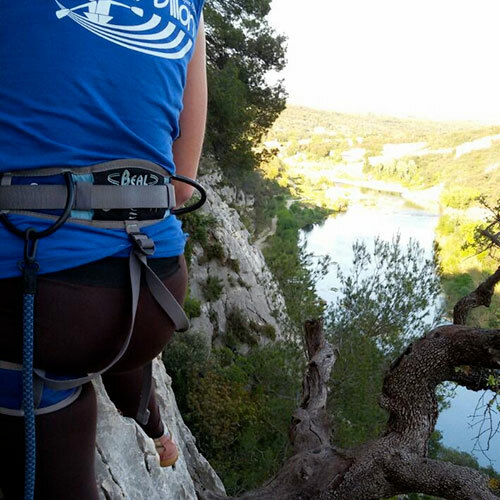 In between Uzès and Pont du Gard, the massif du Gardon invite you to thrill with the via ferrata de Collias. Wonderful landscape and good fun! The tour is approximately 2 hours with two options (red or green) and is equipped with two rope slides and a rope bridge. Difficulty level: moderately difficult (AD). Suitable for sporting beginners and young people from 12 years under guidance! Departure possible between 9:00 and 16:30 everyday. Gear includes : climbing harness, pulley, rope, karabiner, helmet and gloves. NB. RENTING GEAR DOES NOT INVOLVE A GUIDE. sturdy shoes, shorts or leggings, cap or hat, cycling gloves, a backpack, water and a snack. BEWARE OF THE SUMMER HEAT!! The Via Ferrata is located in the blazing sun, rocks and may be still very hot even late in the afternoons. Our team has tested the Via Ferrata and its rope slides for you… And we had a good laugh! What a lovely moment! We agree on the level of moderately difficult (AD) and would not advice this spot for non-sportive and children under 12. IMPORTANT : Children from 10 years old and we advise sporty and dynamique! RAPPEL: Renting gear does not involve a guide.